ST. PETERSBURG, RUSSIA / ACCESSWIRE / February 6, 2019 / The billion-dollar cryptocurrency market has been garnering a lot of attention to everyone around the globe. It has gained fame for good as well as bad reasons within a very short span of time. Many have benefitted and made millions by trading in crypto while a lot have been prey to the huge scams and hacks associated with the crypto world. The disruptive blockchain technology has encouraged an introduction of ICOs offering decentralized solutions for a plethora of problems existing in every industry. While various issues and concerns within each industry and the crypto world are acknowledged, there still exists a major concern of trading in cryptocurrencies. In the wake of major hacks of crypto exchanges and scam ICOs, crypto enthusiasts are skeptical about investing, exchanging or trading with these digital currencies. Trading in crypto faces risks and concerns compromised security, high trading fees charged by crypto exchanges, lack of liquidity causing high price volatility and transaction delays to prevent hacks by cybercriminals. Furthermore, the price and liquidity of cryptocurrency are at the mercy of crypto exchange markets who perform all the roles of brokers, exchanges, exchange houses, and liquidity providers. To add to the list, opening an account in a cryptocurrency and converting or exchanging it for other currencies involves additional transaction costs. The potential of blockchain technology and cryptocurrency market although very evident is not realized due to these existing problems. FortFC attempts to solve the major problems faced by traders in the cryptocurrency market. 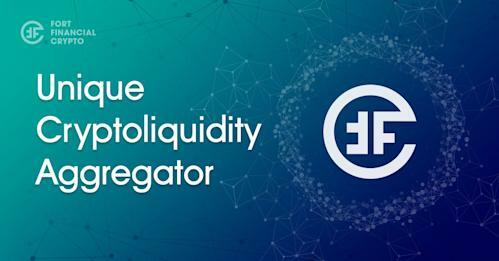 It is a platform that provides cryptocurrency liquidity by aggregating buy and sell orders from a vast pool of famous exchanges. The platform offers services of withdrawing, depositing or exchanging cryptocurrencies with other cryptocurrencies or fiat currency at the best market rates. The platform is backed by Ethereum based blockchain technology with FCCT as the utility token. The token can be used to avail services provided on the platform and offering various advantages to early token holders. FortFC users will be using two methods to trade. The first method allows traders to trade instantly at the best price aggregated from all liquidity sources and is suitable for those who are not very experienced in the market. The second method for experience holders will provide the traders with unabridged quotes from different exchanges which will benefit them in buying crypto from one exchange and selling on another with a higher price. FortFC is a one-stop solution for all information required while trading in crypto. It saves the time and hassle of going through complex price analysis from different platforms and also from the horror of price fluctuations. With a competitive edge as the first player in the industry, FortFC has set out on a rampage to eradicate the plague in the cryptomarket.